Central Istrian wine region, Grimalda area, vineyard Brdo. This is a blend of three varieties – Chardonnay, Istrian Malvasia and Sauvignon Blanc, in ratios of 50- 25-25. The grapes are complex due to low yields on very sunny terraces; up to a kilogram per vine. In the production, quick processing is followed by fermentation and 12 month ageing in allier/ troncais French oak barrels, with periodical sediment stirring. No skin-contact. Following the ageing in barrels, it is further blended and aged in stainless steel vats and in the bottle. 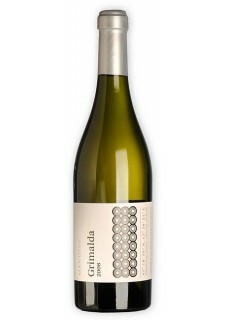 Grimalda White is a terroir wine of pronounced minerality and long fi nish. Special. Food pairing: Fish, pasta with spicy sauces, blue cheeses. Winemaking is not your proverbial 7 to 3 job. It is a challenge you face every single day of the year. It is your working hours and your job description. You contemplate the sky, confer with the sun and the clouds, you discuss with the forecast, have a chat with the grape vines and flatter the grapes…and you are still in your right mind. Actually, to enjoy it, you do have to be a bit zany. And understood by those you care about. Winemaking did not fall out of a clear blue sky, though so much depends on the sky. In fact, it is one of the best rock’n’roll decisions I’ve ever made. Some people thought I was foolish to give up the comfy potential of my PhD degree. Some maintained I was just trying to bottle up my contradictions. I just wanted a job I would not only be doing, but taking seriously. Lifestyle rather than business. The moment I partly joking and partly rising to the challenge filled my first bottle intended for the market in the company of my friends, today my close business partners, there was no going back. It was the birth of this responsibility that still grips me and keeps me going, this concentration and focus that keep my hand steady while it daily hits the moving target. I have not changed the primary reason why I originally set sail into the world of wine. First and foremost, because of my passion. A better man today, more honest and common, more natural and more savage, all due to changes in my life circumstances. Perhaps without the lightness of writing it all out as I was once able to, probably because I cannot always easily rise above the everyday. Yet, I dare think I am successful because what I am doing makes me happy and because I create something that brings happiness to me and to other people at the same time.